To help me with my research and to help myself reach my targets for the end of the week I am going to make a post showing my favourite magazine front covers from the last 12 months to help me create broad ideas for my future magazine. The main purpose and focus of this is to simple research into how the magazines presents their images and how my favourite magazines layout and format their front cover. 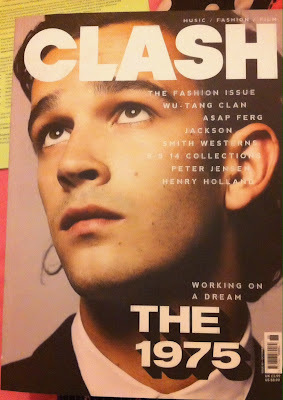 The Magazine Clash is a Music, Fashion and Film magazine, that boast a collection of all different genres of music and tends to keep up with the latest trends in Music, Fashion and Film as all of these topics intertwine together very well Clash is seen to be a fairly popular magazine by the general public, the reason why I have chosen Issue 88 from October 2013 is because it features the singer from the 1975 and the 1975 are becoming an increasingly popular indie band. The Magazine cover shows how the singer is presented i.e were he is looking and were his eyes are looking. 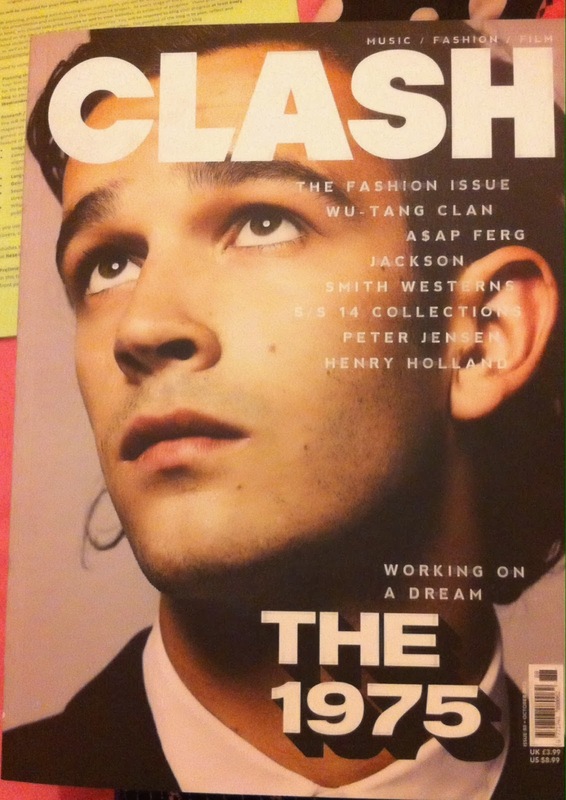 Clash have carefully edited his facial structure by using photoshop and have finely edited his skin pigments edited. The reason why I chose this Magazine front cover is because I like the simplicity of it and how their are 3 different fonts but all of the fonts are the same colour, I like that its a basic design but it looks so affective. The one thing that I wouldn't be able to use in my magazine is the fact that the singer out of 1975 is not looking at the camera as the majority of magazine covers have the artist or group focusing completely of the camera. The Magazine NME is a hugely subscribed magazine that many people throughout the country have delivered to their front doors it features predominately Mainstream Music of all different genres or up and coming artist from various genres that in the future will become mainstream. NME aim to appeal to a mass audience of people. 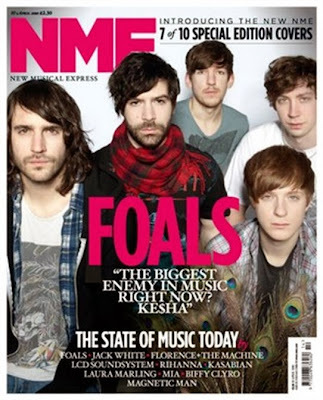 The reason I have chose this front cover is because it features Indie Band "Foals" who have recently started to become a mainstream band since they have recently had a song of theirs called "My number" enter the charts, another reason why "Foals have become increasingly popular is because of their appearances at many festivals in 2013. The Reason why I like this magazine cover is because each member of "foals are looking directly at the camera when this photo was taken and this relates to the kind of photo we had to choose for are first ever making of a magazine front cover. Another reason why I have chose this photo is because I am thinking of doing more than one person in my final product so it was useful to see how more than one person is presented on a magazine front cover. The Magazine Q features all different types of music and is also fairly well known throughout the country it provides in depth information on various music artist that are big in the Uk. The reason why I like this magazine cover is because the Arctic Monkeys feature on this cover and I like arctic monkeys and have been an avid listener of their music from a young age. although this album cover is more than 12 months old I like the fact that lead singer Alex Turner is clearly distinguished as the front man and the rest of Arctic Monkeys are imposed in the background. Another aspect of the front cover that i like is the fact it advertises that their is a Ultimate festival guide inside and made me wonder whether or not I could do something like this in one of the sections of my front cover or magazine. 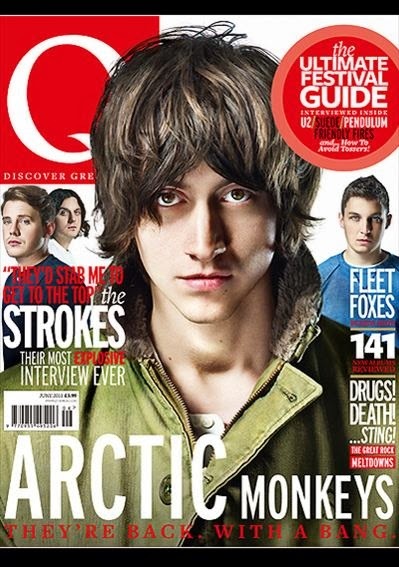 Although there is one thing in particular that i know for a fact that i wont be able to do in my magazine and this is the fact that Alex Turner's hair covers up part of the "Q" title, only well known magazines can do this because they will still be recognised whereas the magazine that I'm creating wont be. The reason why I have chosen to stick with NME is because I am also a big fan of Jack Bugg and the particular issue that covers Foals does not show the qualities that NME is most commonly known for, NME tends to stick to a set colour pallet throughout each of the issues published. 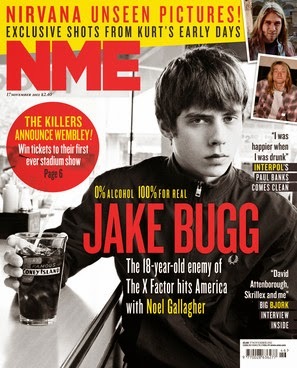 This particular Front page which features Jake Bugg sticks to the colours that NME tend to stick to these are Red, White and Yellow. Although recent issues have showed that NME are trying to variate their colour pallet and in my opinion this is a bad thing because the traditional colour pallet is what makes the magazine recognisable to the nation. The reason why I like this magazine front cover is because its different to other magazine covers out there which will fit in with my "indie" theme for my magazine. The photo taken is less staged than the rest of the magazine covers Jake Bugg is in a natural environment drinking a coke whereas a lot of magazine cover photos are taken in a studio or a completely staged environment, I could potentially use this in my magazine having my models in different to normal setting by doing this it would help me create a sense of realism to my magazine. Excellent research and reflection Tom.